A deeper look at the grooves pressed into the “Mass Apathy” 12” single by NOi!SE. It might not sound like the single most glowing endorsement of a single on the surface, but the first thing that NOi!SE’s new, milled “Mass Apathy” single illustrates is that it’s never wise to underestimate a novelty, or write one off. The bullet casing silhouettes which encircle the exterior rim of this one-sided single (the B-side features a silkscreen but no music) look neat and there’s no way to deny that the care clearly put into manufacturing a “milled single” is impressive, but some critics would argue that such expensive physical production should not overshadow the music on the medium. Some critics could further argue that such “bells and whistles” apparent in the physical presentation should not replace music on a single (which already features a smaller amount of music), but that discussion is better left to those critics who are willing to indulge it – we’ll stick to the music here. And, to be honest, that “Mass Apathy” is able to stand on its own on this release is great – it deserves to. “Mass Apathy” is the best song NOi!SE has released to date. 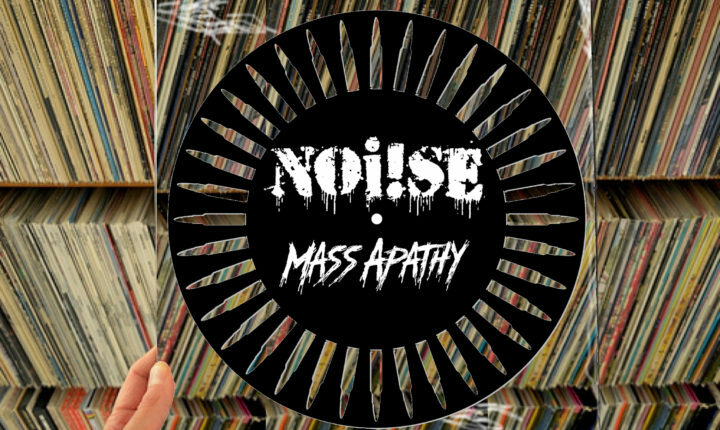 ”Mass Apathy” is guaranteed to have listeners’ undivided attention from the moment the stylus on their record players catches the groove and bass line which drives the song begins to pummel them. That bass line os something of a throwback to an earlier time in punk; incredibly nasal in tone (similar to Mike Watt’s sound on old Minutemen records and Klaus Fluoride’s on Dead Kennedys albums), the instrument drives menacingly as the other instruments begin to assemble around it. Listeners will find that, soon, they’ll be squinting and glaring sympathetically as everything comes together. The kinetic energy with which the performance is delivered is undeniable but, when Matt Henson comes in bellowing lines like “All told, it’s just a scam/ They’re selling values from the back of a van/ We line up for a front-row seat to the sham/ Sympathetic sympathy and internet blame/ We bury kids and we say, ‘It’s a shame’,” he really wrings out all doubt and makes believers out of everyone within earshot. This is not hyperbolic or contrived overstatement, this is pure fury and it’s perfect. Listeners will find themselves hooked, ready and waiting for more. But then, there’s nothing. Where there should be a barn-burning chorus which melts faces or at least singes synapses, there is silence – and, after a second, that bass line picks up again and reasserts its assault but, with no chorus, listeners will be thrown completely off-balance; and then the band does it all again a couple more times for a couple more verses which are perfect aural assaults split with silence where there should be choruses. Those perfect breaks never stop being off-putting through the cut’s two-and-a-half-minute run-time. Those silences become so worrisome, in fact, that when the song ends with the sound of a rifle shot, it’s oddly relieving. NOi!SE’s milled “Mass Apathy” 12” single is out now. Buy it for the price of a donation to your favorite charity here, directly from Pirates Press Records.